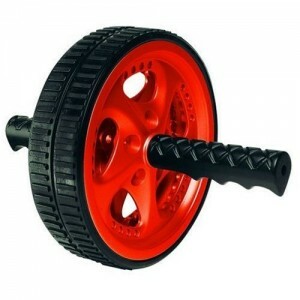 Some people hate the ab wheel, but I’ve always liked it. It works the entire core, and really hits the lower part of the abs, which can be tough to target. I use the Valeo Ab Wheel because it’s inexpensive, sturdy (the bar in the middle is metal so it won’t bend or break), and the two wheels make it more stable than similar products with only one. In case you’re wondering how to correctly use this device, here’s how: Kneel on the floor and put each hand on a handle. Slowly roll away from your knees in a straight line. Keep your head straight and don’t arch your back–keep it straight too. Once you’ve rolled out as far as you can (this may only be a few feet if you’re new to this exercise), reverse the motion and come back to your starting position. As you get better, you’ll be able to roll further and further, until you can touch the floor with your stomach.